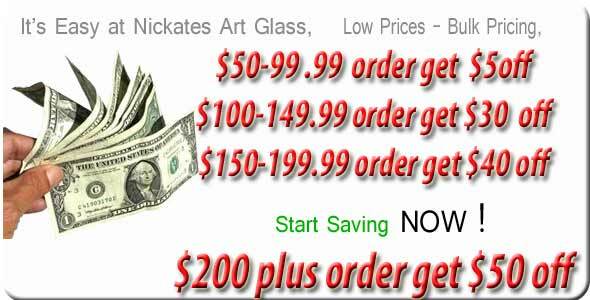 Order over 600 colors of glass from Nickates Staine Glass Supplies Inc.
How to make stained glass - Modern glass making is an extremely refined process. Glass is made basically from silica sand, limestone and soda ash. The mixture is put into a glass furnace and heated to approximately 3000° F, until the raw materials melt into a liquid which can be formed into glass sheets. To color the glass, various metal oxides are added to the raw materials during the glass making operation. These include selenium or gold for red, yellow and pink; cobalt for blue and sulfur for amber. The final price of the glass is most evident when purchasing hot colors like (red, yellow, orange, pink) as gold and selenium are expensive ingredients. Extra glass boxing charges click here for more info.